Trust 1500 vinyl windows to deliver all the benefits of durable, low-maintenance vinyl with stylish options, helpful features and energy-efficient glass packages. 1500 Series Windows. Discover the durable window design that perfectly complements the look of your new home, the way you live and your home’s design style. Convenient Cleaning. 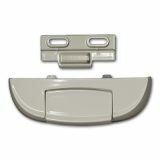 Low profile tilt-latch allows the bottom sash to tilt inside for easy cleaning. Easy to Open. 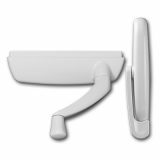 Durable, dual lift rails are readily accessible and allow you to open and close the window with ease. Weather Resistance. Meeting rail interlocks to tightly close the sash around dual weatherstripping and help keep rain and wind out. Dependable Security. Forced entry-resistant cam locks enhance security and meet AAMA forced-entry requirements. ADA-accessible and auto-lock options also available. Smooth Operation. Sash glide smoothly on wide brass rollers. Fingertip Convenience. 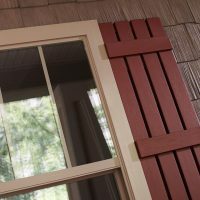 Dual pull/push rails provide easy access to slide the sash. Reliable Safeguard. Enhanced security cam locks meet AAMA forced entry requirements. ADA-accessible and auto-lock options also available. Easy Cleaning. 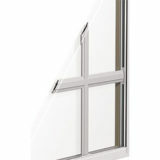 Operable sash can be removed for cleaning. Single Hand Functionality. Operating handle opens the sash with minimal effort. Dependable Protection. 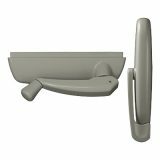 Multi-point lock provides maximum security by securing the window at several separate locations. Optimized Airflow. Sash opens up to 90 degrees for maximum ventilation. Streamlined Handle. Nesting handle folds into the base and won’t interfere with window treatments. Design Flexibility. 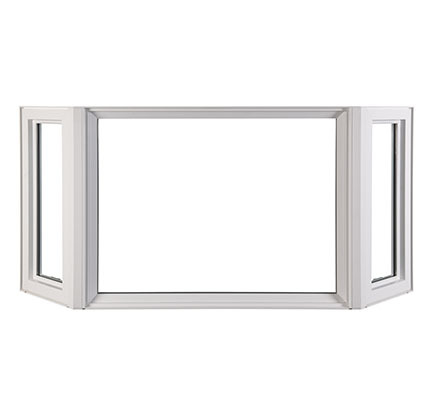 Multiple Casement windows can be combined together and with other window styles to create a unique configuration. Refreshing Breezes. 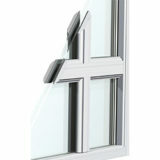 Top hinge design swings outward from the bottom and can remain open during light rain for ventilation. Reassuring Protection. 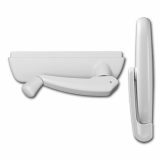 Achieve increased security with a multi-point lock that secures the sash at different points with one simple action. Reliable Strength. Sturdy stainless steel hinges fully support sash. 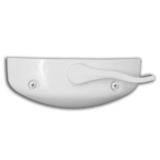 Discreet Handle Design. 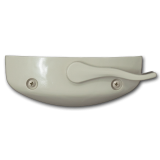 Nesting handle rests neatly on the base and won’t interfere with window treatments. Expansive View. Provides an unobstructed viewing area. Superior Thermal Efficiency. Fixed design, with no moving parts, delivers excellent energy performance and weatherability. Installation Versatility. Create a beautiful combination with operating styles and geometric windows. Water Resistant. 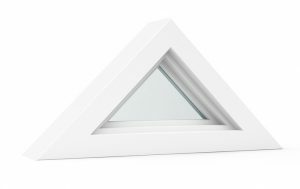 Frame is designed to direct water away from the window and your home. Stylish Accents. Geometric windows feature unique circular, arched and linear shapes. Excellent Energy Efficiency. Non-operating style provides reliable thermal performance and weather-resistance. Unlimited Design Possibilities. 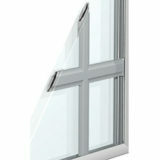 Can be combined with other window styles to create a stunning configuration. Increased Weatherability. 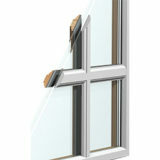 Frame design quickly directs rainwater away from the window. Added Seating. Creates an airy space for relaxation, reading or to display collectibles. Dramatic Visual Effect. 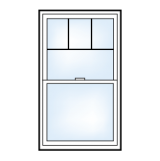 A bay window combines three windows at 45° or 30° angles for added character and dimension inside and out. A Breath of Fresh Air. 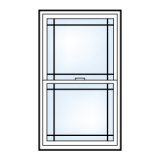 Featuring a picture window center lite that can be flanked by single hung or casement windows for ventilation. Color Flexibility. Head and seat boards can be stained or painted to complement your interior décor. Reliable Strength. A unique cable support system utilizes a zero-slip clamp for precise installation and support over time. Gently Curved Appearance. 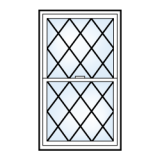 A bow window combines three or more windows at 10° or 15° angles for a more rounded look. Create Your Own Combination. 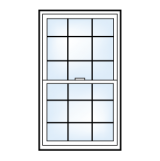 Select single hung, casement or picture windows or combine styles to create your bow window. Interior Style. Stain or paint head and seat boards to match your home’s color palette. Continuous Support. 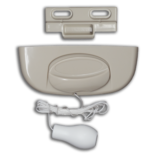 Installed with a state-of-the-art cable support system and zero-slip clamp for ongoing strength. 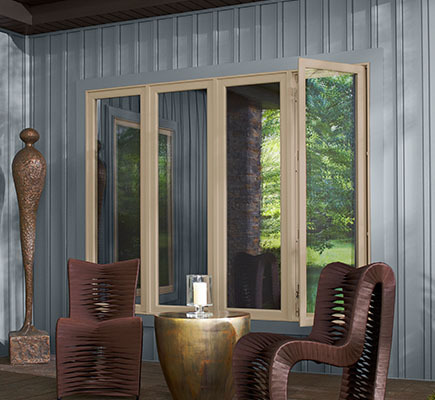 Available co-extruded black and bronze exteriors offer long-lasting beauty. 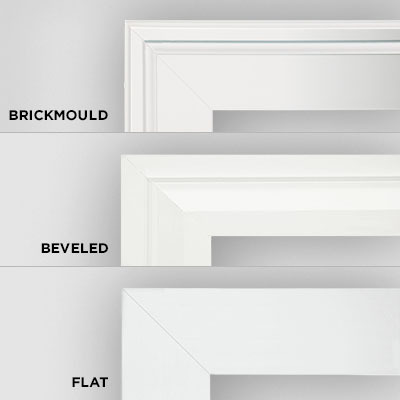 Chose a brickmould, beveled or flat frame style to coordinate with your home’s architecture. From forced entry-resistant cam locks to specialty auto and ADA locks, 1500 series hardware offers the functionality you need. The 1500 series offers advanced energy-efficient glass packages to help lower heating and cooling bills while keeping your home comfortable season after season, wherever you live. Precise, quality vinyl construction means each window performs dependably, opening, closing, locking and tilting with ease. Strong, interlocking components help keep wind and rain at bay. Durable vinyl construction requires virtually no maintenance to retain its beauty for a lifetime. 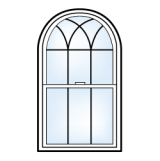 Advanced glass options are available to meet your solar, sound, security and privacy needs. Classic colors, including stylish black and dark bronze exteriors, allow you to create a custom look. A choice of frame options complements classic and contemporary homes. Add charm and curb appeal to your home with grille styles in a choice of three profiles and five patterns. Multiple window styles can be combined in a single frame for a stunning configuration that is weather resistant and energy efficient. Virtually unlimited size options make the 1500 series the perfect choice for your new home. 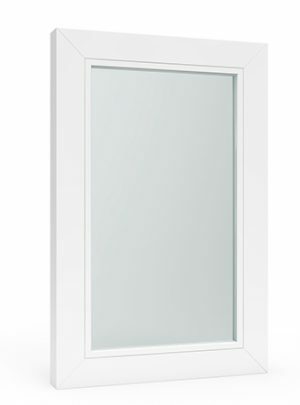 A Limited Lifetime Warranty and 20-year glass warranty provides comforting peace of mind. See the 1500 series warranty for complete details. 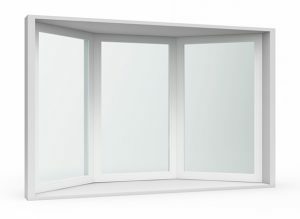 Advanced, high-performing glass packages available in the 1500 series can help reduce heating and cooling costs, keep outside noise from entering your home, and increase your home’s safety and security. Choose Low-E glass packages that feature a transparent coating that helps deflect heat in summer and keep warmed air inside during winter for season after season of comfort. 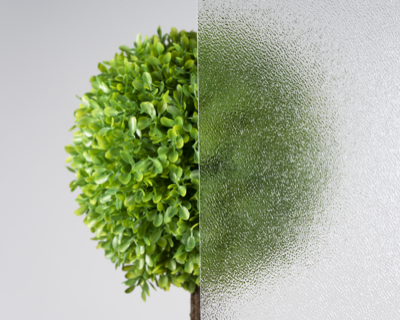 For added insulation against energy loss, Argon gas, which is six times denser than air, is sealed between the glass panes in High Performance HP glass packages. For the ultimate in thermal efficiency, available HPMax triple-pane glass packages provide two separate insulating airspaces and multiple surfaces of Low-E.
1500 series windows can be ordered ENERGY STAR® certified wherever you live. 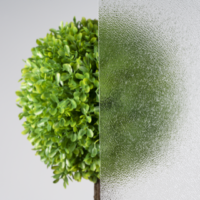 To optimize your home’s safety, choose laminated glass, featuring a remarkably strong PVB interlayer that helps guard against forced entry around the clock. The 1500 series offers acoustic glass packages that give noisy neighborhoods and busy streets the silent treatment. Acoustic and laminated glass help block sound vibrations from passing through the glass, reducing unwanted noise by up to 50%. 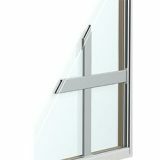 1500 single hung and casement impact windows pass stringent tests to meet coastal wind requirements with laminated glass that maintains a window seal in high-impact situations. Reduce fading of your furnishings, window treatments and flooring with optional Low-E or laminated glass that helps filter the sun’s harmful ultraviolet rays. 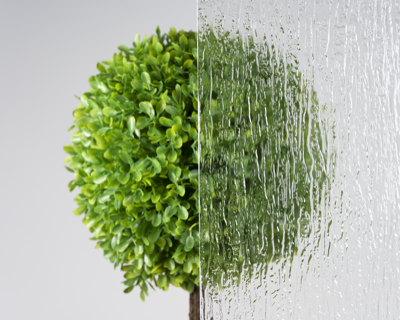 Pattern glass, such as obscure and rain, uses texture to maximize your privacy while allowing desirable sunlight inside. Accentuate your home’s architectural design with the 1500 series’ unique grille profiles and patterns. 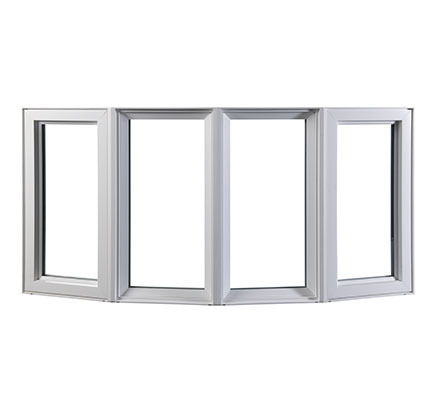 Window grilles between the glass (GBG) provide a smooth, easy-to-clean surface, while simulated divided lites (SDL) feature the look of a traditional multi-lite window. Learn more about how the 1500 series can enhance your home and your life. Select literature below to download now.